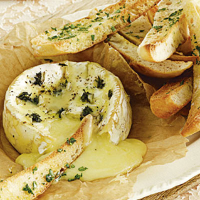 Fingers of hot garlic toast dunked into melted parchment-baked cheese are great for sharing. Preheat the oven to 200°C, gas mark 6. Lay the cheese in the centre of a 30cm-square piece of baking parchment. Using the point of a sharp knife, make lots of deep slits in the surface of the cheese. Place the garlic slices, along with a little piece of thyme, into each slit. Drizzle the surface of the cheese with the tablespoon of oil and add a scattering of coarsely ground black pepper. Gather the parchment up to form a purse and tie with kitchen string. Bake for about 10 minutes until the cheese is melted in the middle. Meanwhile, make the fingers of toast. Preheat the grill to medium. Cut the mini ciabatta in half diagonally and then cut each piece in half lengthways to make thin, elegant fingers. Toast the bread until golden. Drizzle with olive oil and rub generously with the cut garlic clove. Scatter lightly with the parsley, rubbing it into the bread so that it sticks. Sprinkle with a little sea salt. Other types of cheese with a rind, will also work well cooked in this way. Try Vacherin Mont d'Or.